This week we had the pleasure of staging 2 red dining rooms in two distinctly different homes, in 2 different parts of Los Angeles County (Hancock Park and Arcadia) and at 2 different price points, $1.5M & $3.5M. 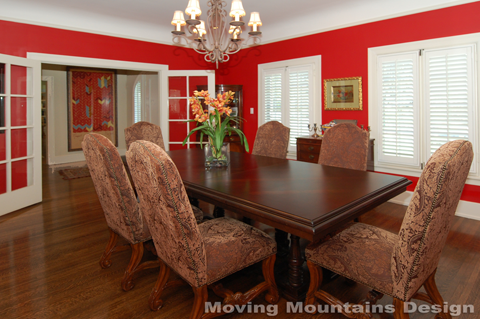 Some less experienced home stagers might shy away from a project with red rooms, or might suggest that the home owners paint the room another color. Not me! I love a challenge, in this case making the rooms feel like red was exactly the right color. And I love the energy that red brings to any home staging project. The first home in Arcadia was completely vacant, so we brought in all the furniture, rugs, accessories and artwork. 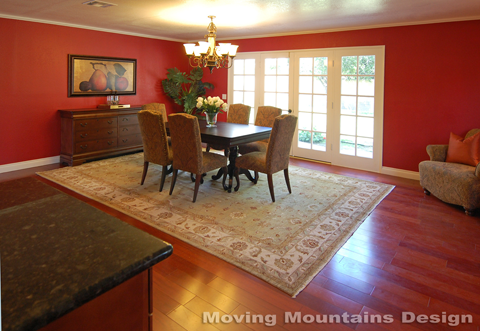 I chose an olive rug with red accents to help absorb some of the red of the room without adding to the “fire”. The second home, the Hancock Park home staging project, is occupied. I incorporated some of the home owner’s furnishings and artwork (they have a stunning art collection-lucky me!) but brought in a larger more substantial dining table & chairs, that really fit the style of the home. In both cases, the red walls will really make these homes memorable, and not in a bad way. The wall color was incorporated into the home staging plan and works in concert with the home staging to add personality and a very unique quality.